Earlier this month, ARS was proud to participate in Used Car Week in Scottsdale AZ. A production of Cherokee Media, UCW is a huge annual event with thousands of attendees and exhibitors. 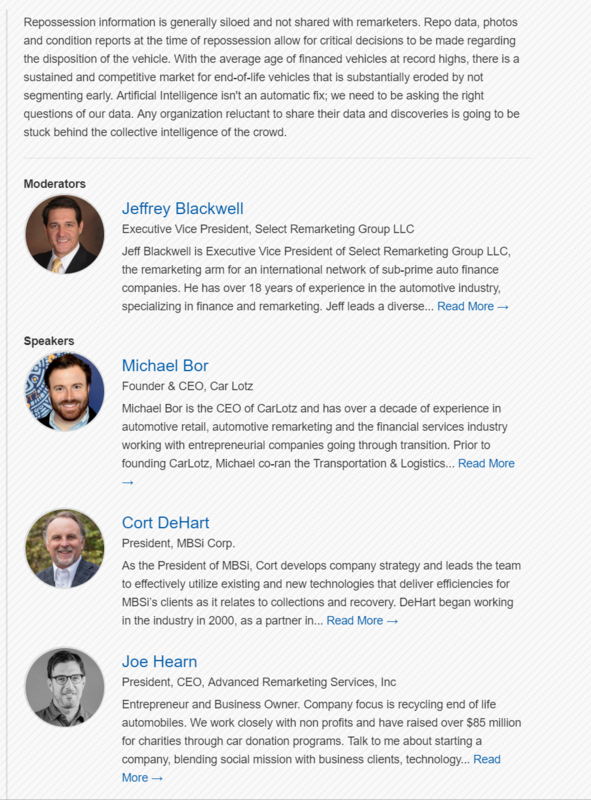 The conference carries one of the broadest conversations about remarketing, finance, repossession and dealer sectors. It’s one of our favorite conferences of the year and a terrific time to catch up with clients and partners. We’ve attended this conference and others produced by Cherokee media for years. This year we were invited to participate in a panel conversation regarding data segmentation and triage. While the session started a little earlier than most would have liked, it was well attended and we had a lively conversation about data segmentation, AI and examples addressable marketplace. We heard from several people in attendance that it was one of the most interesting sessions that they attended. It’s also a very good time to collect economic feedback and insights for our clients. We very much appreciated the contributions of the Economic Roundtable and the focus on current market forces. Watching movement in the mortgage and real estate sectors, especially significant as Real Estate and Auto represent about 22% of US economy. It currently appears with higher rates that there is too much risk at subprime, (no benefit for lender) and they expect that area to cool off also. Looking downfield, the appetite for crash avoidance and driver assist will have an effect on the value of vehicles without those options. There was also a conversation about ‘Economic areas of promise’ Specifically, Infrastructure spending would be very good for the economy. And that the current administration’s willingness for deficit spending and monetary policy would have positive effect. Overall a very good week for ARS. We had some terrific conversations and attended some strong, inventive and insightful presentations.